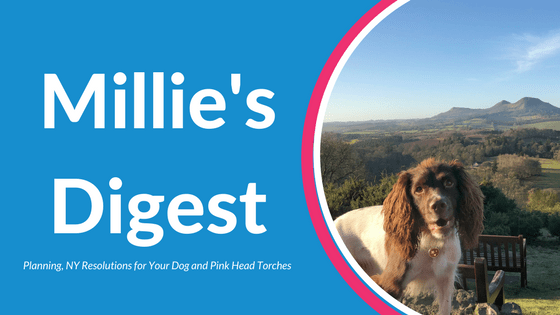 We may be off on our hols this week, re-opening Saturday 13th January, but I’m super excited to share our first Millie’s Digest of 2018 with you! #1 Planning, Planning and More Planning! For someone who is normally super organised, due to one reason or another, my goal setting has been so much later this year! But the good news is that as I write, most of our plans are now set. Whoop!!! One of the biggest things I’ve been reflecting on is my inconsistency in blogging/videos etc. While we’ve produced a large volume of blogs and info over the past few months, it’s sporadic. There is no real consistency in days that these are published etc. You’ll also see a number of blog, video and podcast series which I’ve scheduled in throughout the year. I’ve just published the first of these which is an 8-week blog series with our favourite homemade dog treats. Today’s blog tells you everything you need to make some yummy Peanut Butter and Pumpkin Dog Treats, which you can find HERE. As always, if you have requests for info, advice or ideas in general, do leave a comment below. If you didn’t see my video on Christmas Eve, then you’ll be pleased to hear we did have a winner! The fab Sherlock was our lucky pooch to win all those goodies and his lovely pawrents shared some photo’s over on their dog boarding and dog walkers Facebook page Boarding Buddy’s’. We think he looks happy! Don’t worry if you missed out on winning this time round. I’ll be emailing out a little offer just to those of you who entered – keep an eye out for that email! We have just 6 dates left in January, with our first available appointment now on Thursday 18th January. Do just hit reply or give us a call on 01241 857893 when we reopen on Saturday 13th January. No real surprise that many bloggers and dog magazines have been focusing on new years resolution articles. My favourite is this one via Your Dog which shares their top 6 new year resolutions for dog owners. I also found this article in The Telegraph interesting, which suggests that more and more dog owners are travelling abroad as they find Britain unfriendly towards dogs. Reflecting on my own experience this week on travels, I can relate to some of the article. 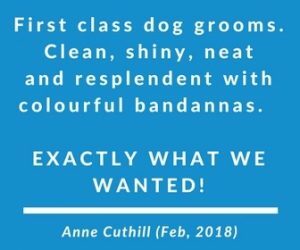 I find that half the battle is finding dog-friendly accommodation and places to go as it’s not always immediately obvious from websites, social media and even the premises themselves. Hopefully, the more we can share our ‘secret dog-friendly’ finds with each other, the easier it will get. Feel free to holler if you find somewhere you’d like us to shout about and I’ll be sharing some reviews from our weeks holiday with you asap! 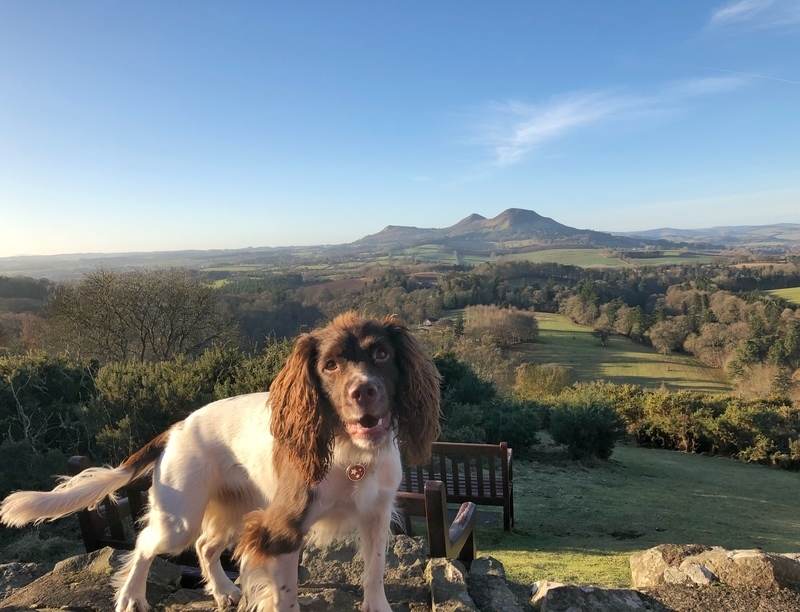 Millie hanging around at Scott’s View – yep it is freezing but stunning in January! After all those Christmas presents, you can imagine that Millie hasn’t required a huge amount! But as I sit here typing away, both her and Harley are enjoying their Sunday Lunch which always consists of a raw treat! You can read all about our choice of dog food Guru HERE but after our long Sunday walks, they are treated to a raw treat! While there are the usual differences of opinion on feeding a mix of raw and kibble based diet, for Millie and Harley, we’ve had no issues with the introduction of bone once a week. However I suspect this is down to the quality of their main Guru diet too! Just before Christmas, I was determined to get back into a routine and doing some Canicross with Millie and Harley. There was just one issue. It is winter and due to working hours, my running time is limited mostly to when it’s dark! Having had a quick chat with Steve Bonthrone (Steve Bonthrone Fitness), he recommended that I check out Unilite for their great range of head torches. After a few direct tweets with more than helpful advice to help choose, I had the pink UniLite Sport-H1 Neon LED Head Torch in my shopping cart and it arrived just after New Year. Even if you’re not a runner, I’d def recommend investing in a head-torch along with your dogs LED collar. While UniLite also has handheld torches, I find being hands-free more than helpful out on those dog walks and so far, so good with this one!